Tom Collins feels this is the season that can help Saints to get out of their ‘downward spiral’. The black, green and gold have slipped down the Aviva Premiership table since topping it for the first time in their history in 2015. They finished fifth the year after, then seventh and then ninth during the previous campaign. But with new boss Chris Boyd drafted in during the summer, hopes are high for a much loftier finish this time round, despite the fact the league looks stronger than ever with ambitious Bristol Bears having won promotion. “You look at the competition and we’ve had the conversation as a club that in years gone by there would be an easy place to go, but this year, you can’t look at a team like that,” Collins said. “It’s so competitive, so close and every team has got their advantages. “Last year wasn’t a good year for us. We have had a downhill spiral since we won the Prem and I’ve seen that. “I’ve been here, won the Prem and then come back down again and it will be interesting to see how we react. “We’ve got a new show of faith and togetherness and it seems really positive. “We can only look forward to the first two or three pre-season games and then into the season. 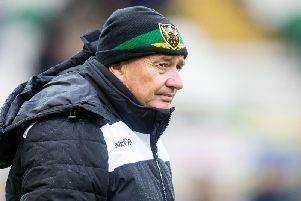 Collins, who has made 50 appearances for Saints since graduating from the Academy, is enjoying life under new boss Boyd with a fresh style now in place at Franklin’s Gardens. “It’s going to be a tough first few games to get to know a completely new way of playing and a totally new structure,” said the 24-year-old. “Obviously we want to win games because it’s not very nice going into a game and then getting battered after working hard all week. “We’re working hard and we want to put down a marker to show teams where we’re at. “Teams came to the Gardens last year and they didn’t feel as nervous as they had in previous years when it was a really tough place to play.